Julia contacted me needing help finding a photographer to document her pregnancy and her first child who is due in May. She wanted to find someone who had a classic, relaxed style to posing. She prefers a timeless look with nothing over the top. My kind of gal! She wanted to look flattering and effortless in her maternity photos and sent me a few photo samples to give me an idea. After chatting back and forth she decided to book both sessions with me! I offer a mini maternity session for clients who book any of my newborn session options. This add on is a great value! Maternity sessions allow us to get to know one another before your baby arrives and you get to document such a special time in your life! Some women prefer a laid-back type of maternity session with jeans and a sweater. I offer these sessions in my studio for a cozy, bright look. Julie opted for an outdoor session and wanted to wear a long dress to show off her bump. We talked about what location she envisioned. It’s important to me that you have an input on your session location. Once she mentioned nature and outdoors I knew how to narrow down the location. Even though it’s April, a lot of the trees haven’t bloomed yet. We met at Jeffrey Mansion in Bexley, Ohio. They offer a huge staircase, the beautiful mansion (of course), some blooming tulips and more! I captured a mix of portraits of Julia with Zach, and then some solo photos of Julia to show off her bump and beautiful dress! She has the most gorgeous hair, too! I kept saying she looked like a Disney Princess in the woods and standing on the mansion balcony. 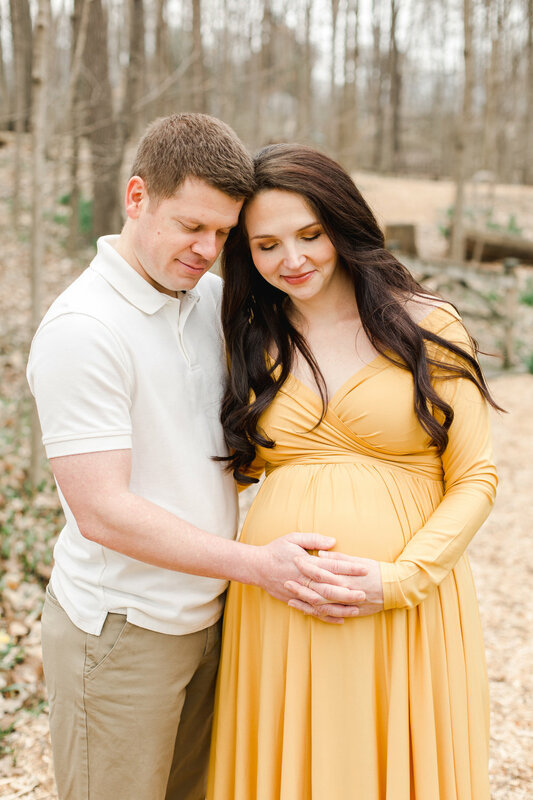 I just loved working with them and can’t wait for their newborn session in May! Here are my favorite images from their maternity session in Central Ohio!